Is your library website in need of a little pizzazz to better engage your patrons, but you’re short on time and resources? 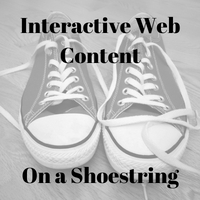 Would you like a better way to present images and videos in context on your website? Are you looking for a faster and more flexible way to create online tutorials? If you answered “yes” to any of those questions, look no further! H5P is an open source framework for designing interactive web content. There are dozens of options, and you don’t need any special code or scripting expertise to use it. Best of all, it’s free! In this workshop, we will take a look at some examples of library-related H5P materials, including a floor map with embedded media, an interactive video, a short tutorial, and a game. Then you’ll have a chance to make and publish your own H5P content for your library. We will include a review copyright guidelines and best practices for instructional design to your new interactive web content. Bring your own wifi-enabled laptop and charger. (If possible, please charge your laptop in advance.) For the best experience users should be familiar with the laptop they bring. Must have basic computer skills, including internet use and word processing software such as MS Word. Familiarity with a web content management system such as Wordpress is helpful but not required. Must have a Google account. If you do not already have one, visit https://accounts.google.com/ and click “Create account.” Be sure to make note of your username and password! We will create a free H5P account during the workshop. You will need email access to complete this process. This workshop is aligned with the MLS strategic plan goals of Co-Creator Culture, in which MLS will build and nurture a co-creator culture within the Massachusetts library community, and Marketing and Communications, in which MLS will help member libraries to expand capacity for marketing and communications. Join us for the morning workshop, too! Getting Started with Canva. Register separately for both programs. We’ll break for an hour in between the morning and afternoon workshops. Bring a bag lunch or enjoy lunch on your own.